KUBOTA BALE WRAPPERS. DON’T WASTE YOUR FORAGE – PROTECT YOUR INVESTMENT. Kubota’s line of bale wrappers provides higher quality silage, with less time spent in the field. Quality bales start with Kubota’s line of foraging equipment and end with Kubota’s bale wrappers. 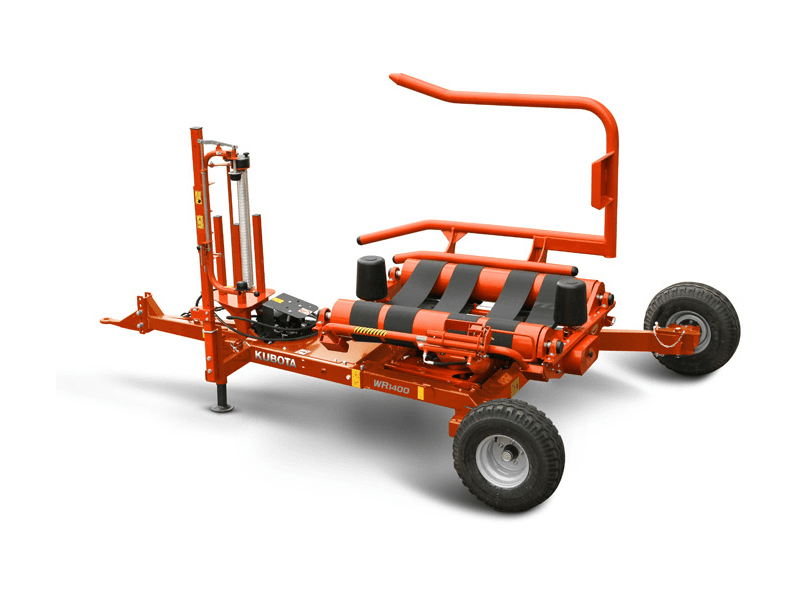 EASY TO OPERATE: The Kubota WR1400 is a pull-type wrapper designed for smaller tractors. The machine is very easy to operate. A fully automatic film cutter comes standard on all models. TURNTABLE PRINCIPLE: The turntable with two driven rollers is designed for high bale stability and smooth, even rotation. This ensures consistent bale rotation even in the most difficult of conditions. GENTLE UNLOADING: Wide spaced wheels allow for an exceptionally low turntable height. This design allows the table to be tilted downward until it nearly touches the ground, reducing drop height when unloading bales. This provides the gentlest possible handling of wrapped bales. It reduces the chance of film damage and eliminates the need for a fall damper or drop mat. Additionally, it can be fitted with a bale on end kit, which allows the bale to be tipped off gently without damage to the bale. EXTENDABLE WHEEL ARM: To allow for increased stability during bale loading, an extendable wheel arm was incorporated into the frame design. This allows bales up to 2650 lb. to be loaded without any counter weight on the machine. NARROW TRANSPORT WIDTH: For narrow transport width, the right hand wheel is turned to the inside of the support arm.